Mary Winsor, of Haverford, Penn., came from a Quaker family. She was educated at Drexel Institute of Philadelphia, at Bryn Mawr and abroad. She made a survey of the English suffrage movement for the American Academy of Political and Social Science. She was the founder and president of the Limited Suffrage Society. September 1917, sentenced to 60 days at Occoquan Workhouse for picketing. She was later sentenced to 10 days for participation in Lafayette Square meeting. Harris & Ewing, Washington, D.C. Mary Winsor Penn. '17 holding Suffrage Prisoners banner. United States Washington D.C, 1917. [Oct.-Nov] Photograph. https://www.loc.gov/item/mnwp000225/. With upcoming Texas local elections looming less than a week away, I’m amazed that some eligible voters will stay home and not vote. The United States Constitution did not originally guarantee citizens the right to vote. As I remember from my history lessons, only white male property owners had that privilege. It took almost two hundred years (and many more lives than that) to secure the right to vote for all citizens of age in the USA. People died for our right to vote. It’s an insult to this history to not vote. The intention of this amendment was to give freed MALE slaves the same privileges offered the white majority males. [Notice there is no mention of women.] States got around this amendment by creating barriers to prevent minorities from voting. These barriers became known as “Jim Crow” laws. 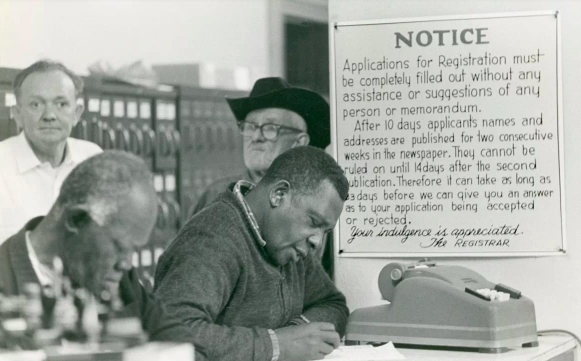 Jim Crow laws included literacy tests to exclude under-educated Americans from voting; grandfather clauses saying if your father voted then you could; and poll taxes—fees charged for the right to vote. This is perhaps the most significant amendment of all in regard to voting as it gave over 50% of the population the right to vote. Until this amendment, more than half the eligible voters in the USA were denied the right to vote! And this amendment did not come easy. It literally took generations of women willing to suffer humiliation, jail and injury for this amendment to finally become law. It took decades of protest. This amendment made some of the Jim Crow laws illegal. We have the Vietnam War to thank for this one as the question was raised as to why 18 year olds can fight and die for their county and yet are not eligible to vote for members of Congress who send them to war. Although not an amendment to our constitution, this act applied a nationwide basis to outlaw the discriminatory voting practices adopted in many southern states after the Civil War, including literacy tests as a prerequisite to voting. It was an Act to enforce the 15th amendment. Why let other people decide what is best for you? You have a voice. Educate yourself on the candidates and issues and then vote. You still have two days left in Garland to vote at either the South Garland Library Branch of at Richland College (Glenbrook & Walnut) 7am to 7PM Monday and Tuesday. WANT TO LEARN MORE ABOUT THE LOCAL GARLAND ELECTION?